Very pleasant unique, modern, bright, first floor seafront 2 bedroom corner flat, with six French windows overlooking the sea and beautiful tropical gardens to the side. 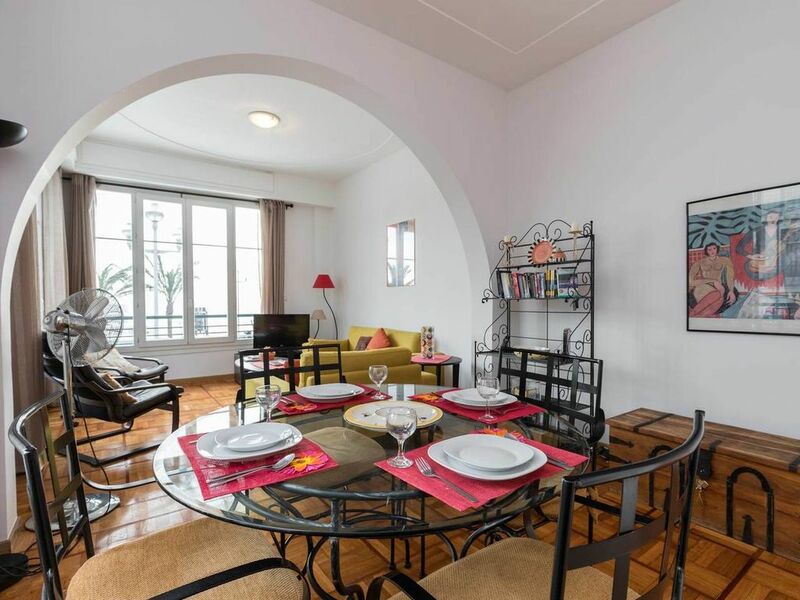 The Apartment is fully equipped on the main Promenade des Anglais, beach across the street, public and private. Has A/C. The building is 100m away from the world famous Negresco hotel, buses to the airport and other towns in front of the building. Railway station about 10 min walk which takes you to Cannes, Monaco, Italian Riviera etc. GARAGE is an option.Close to the fascinating old town (Vieux Nice), famous for its flower, antique and vegetable markets that turn into lovely restaurants in the eve. Nice caters for all tastes, rich with museums, art galleries, opera house, music festivals,water sports,golf, skiing 1hr.away .A great location for a fantastic holiday. The area offers sunshine year-round, delicious Mediterranean food.You'll love every minute and our apt will be the first step to an unforgettable holiday. Homeaway.co.uk tells me that this apt scored top as the most enquired about in the Cote d'Azur region. The big bathroom is fully tiled to the top with Italian beige marble with terracotta edges. The shower enclosure is very big and it has a power big shower head. Hot water available always. The basin is white large modern with a mirror equipped with lights handy for shaving and make-up. There is an extra heater in this bathroom too. The second bathroom is smaller also tiled with Italian terracotta colour marble to the ceiling. Shower enclosure and hot water all day. White modern basin with lightened mirror . There is a lift in the building which we only use for our shopping since we are only on the first floor, almost by the front doors. Also there is a pram or buggy so no need to bring yours, please request cot,high chair and pram if needed at booking. Linen for cot must be provided by you to avoid any problems with allergies etc. The bedroom has one hair-dryer . We really enjoyed our stay in this apartment. Every thing was perfect. Excellent view, modern kitchen, and fairly quiet. Frances made all things go with ease. Would definitely stay here again. My 3rd stay here and it’s always great. Many thanks Nadine (Owner) and Frances (Local Agent) for making this stay as welcoming as always. This is a great place to stay while in Nice. The apartment was more than two people needed, but the location was great. Thank you! This is a great apartment, close to everything, with beautiful views. We would definitely go back again. Apartment is as shown. It was clean and the beds were comfortable. We had a great time there and found the property manager to be very responsive to any questions. It is in a great location. Lovely to see the sun set or rise over the sea while sipping wine or coffee in your own apartment. Noise is the cost of being in such a central place and above a very good restaurant. However, the shutters are a big help to isolating the traffic noise.